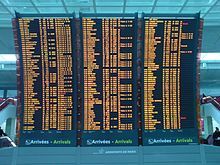 Paris Charles de Gaulle Airport (French: Aéroport de Paris-Charles-de-Gaulle, IATA: CDG, ICAO: LFPG), also known as Roissy Airport (name of the local district), is the largest international airport in France and the second largest in Europe. Opened in March 1974, it is named after Charles de Gaulle (1890–1970), leader of the Free French Forces during the Second World War, founder of the French Fifth Republic and President of France from 1959 to 1969. 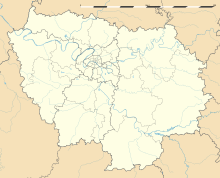 Charles de Gaulle Airport is located within portions of several communes 25 km (16 mi) to the northeast of Paris. Charles de Gaulle Airport serves as the principal hub for Air France and other legacy carriers (from Star Alliance, Oneworld and SkyTeam), as well as a focus city for low-cost carriers easyJet, Vueling, and Norwegian Air Shuttle. The Airport is operated by Groupe ADP under the brand Paris Aéroport. According to La Tribune newspaper a new Terminal 4 is likely to be built around 2025, when Charles de Gaulle Airport's maximum capacity of 80 millions will be reached. This new Terminal 4, when constructed, will be able to accommodate 30–40 million passengers per year and will most likely be built north of Terminal 2E. 4 trains per hour to Saint-Rémy-lès-Chevreuse calling at all intermediate stations to Cité Universitaire, then Bourg-la-Reine, La Croix de Berny, Antony, Massy–Palaiseau and then all stations to Saint-Rémy-lès-Chevreuse. 4 trains per hour to Massy–Palaiseau (on the Saint-Rémy line), non-stop express until Gare du Nord and then all stations to Massy–Palaiseau. The express RER B only call at the railway stations of Terminal 1 (also for Terminal 3) and Terminal 2 before Gare du Nord. Journey time is 30–35 minutes. The stopping RER B take about 35–40 minutes and is sometimes overtaken by the express RER B trains. 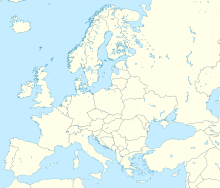 Some low-cost airlines also advertise Beauvais–Tillé Airport and Châlons Vatry Airport, respectively 85 kilometres (53 mi) and 165 kilometres (103 mi) from Paris proper, as serving "Paris" with Paris–Beauvais and Paris–Vatry. 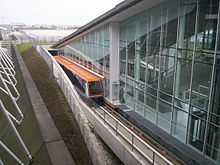 Beauvais airport has no railway connections, but there is a shuttle bus to central Paris 15 times daily. On 6 January 1993, Lufthansa Flight 5634 from Bremen to Paris, which was carried out under the Lufthansa CityLine brand using a Contact Air Dash 8–300 (registered D-BEAT), hit the ground 1,800 metres (5,900 ft) short of the runway of Charles de Gaulle Airport, resulting in the death of four out of the 23 passengers on board. The four crew members survived. The accident occurred after the pilot had to abort the final approach to the airport because the runway had been closed: the aircraft immediately ahead, a Korean Air Boeing 747, had suffered a blown tire upon landing. In December 2015, an airport worker was arrested for taking €20,000 which was dropped by the Moroccan ambassador to the United States, Mohamed Rachad Bouhlal, in the Air France VIP lounge. ^ a b LFPG – PARIS CHARLES DE GAULLE. AIP from French Service d'information aéronautique, effective 28 March 2019. ^ "Info et actualité en direct – Toutes les actualités et infos". LCI. ^ "AIR FRANCE HEAD QUARTERS – ROISSYPOLE." Groupement d'Etudes et de Méthodes d'Ordonnancement (GEMO). 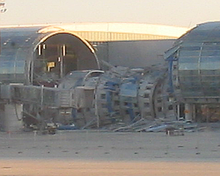 Retrieved on 20 September 2009. ^ a b 2017, UBM (UK) Ltd. "Aigle Azur plans extra seasonal Paris CDG – Algeria service in 3Q17". Routesonline.com. Retrieved 16 October 2017. ^ 2017, UBM (UK) Ltd. "airtransat extends Quebec City – Paris to year-round in S18". Routesonline.com. Retrieved 16 October 2017. ^ a b c d e f "Leisure flights – Charter flights". aslairlines.fr. ^ "Blue-Air | Airline Tickets and Fares – Select". ^ "China Eastern schedules Qingdao – Paris June 2019 launch". Routesonline.com. 13 April 2019. Retrieved 13 April 2019. ^ "News – Finnair". Company.finnair.com. Retrieved 16 October 2017. ^ "Zboară la Paris, la Charles de Gaulle cu Fly One, cu doar 70 de euro! - Flyone". Flyone.aero. 11 December 2016. Archived from the original on 2 February 2017. Retrieved 16 October 2017. ^ "Hainan Airlines adds Chongqing – Paris from Dec 2018". routesonline. Retrieved 7 November 2018. ^ "Hainan Airlines adds Guiyang – Paris service from late-March 2019". RotuesOnline. 7 March 2019. Retrieved 7 March 2019. ^ "Hainan Airlines plans Shenzhen – Paris launch in December 2018". Routesonline. ^ "Pegasus adds Ankara – Paris service from mid-Dec 2018". routesonline. Retrieved 13 December 2018. ^ "TUIfly.com – Schedule". Retrieved 7 October 2018. ^ "Turkish Airlines resumes Ankara – Paris from late-Oct 2017". routesonline. Retrieved 23 October 2017. ^ Liu, Jim (25 January 2019). "Ural Airlines adds Moscow Zhukovsky – Paris service from April 2019". Routesonline. Retrieved 25 January 2019. ^ "WestJet outlines 787-9 long-haul and new Calgary – Europe service in S19". RoutesOnline. October 10, 2018. Retrieved October 10, 2018. ^ "Xiamen Airlines has opened bookings for its planned Fuzhou – Paris CDG service, however only in full-fare (J/Y/H class). 3 weekly 787-8 from 11DEC18". 2018-07-06. ^ "AirBridgeCargo Airlines – ABC in Europe". ^ AFP (24 December 2015). "Paris airport worker arrested after taking €20,000 dropped by ambassador". Telegraph.co.uk. Retrieved 16 October 2017.